1. He maybe looking smarter on the sidelines nowadays, but there’s no dimming of Lambert’s touchline fire. His dugout battle with Mourinho was an interesting side-show to the on-pitch action at Stamford Bridge. “My view is that Paul [Lambert] reminds me of me when I was his age,” said Mourinho, after the game. “[When] he is on the bench, he complains about every decision. That is exactly how I was 10 years ago.” Ultimately a backhanded compliment, there’s no doubt Lambert got the Special One’s attention. 2. Increased Resilience. Last season, if Villa went a goal down in the first six minutes, player’s shoulders would slump, while supporters would get pessimistic; it would be game over. Now there seems to be a harden edge to the team and we’ve gone to both the Emirates and Stamford Bridge looking to win. No fear! 3. We are a pain to play against. Chelsea and their manager know they’ve been in a fight. Wenger won’t admit it, but the score line tells the story. The ‘young and hungry’ player transfer policy is baring fruit with Villa now possessing a team that is very much up for the fight. 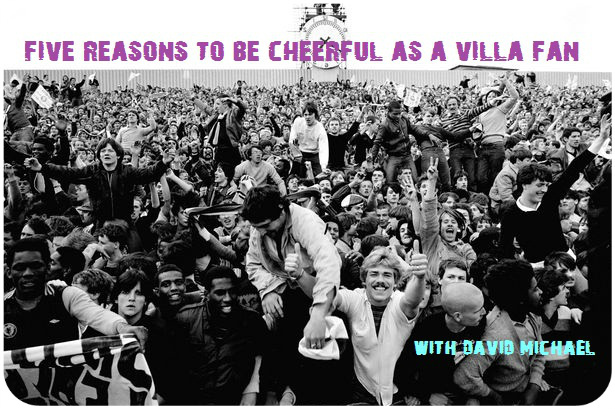 Villa, with such spirit, will be tough to beat for any team. 4. Nobody typifies Villa’s improved fight, than the ever-improving and tenacious Fabian Delph. As well as being snappy in the tackle and showing tireless effort for the cause, Delph has also been getting forward more too and was unlucky not to score against Arsenal. Expect him to chip in this term with a goal or two. 5. The fixtures will soon start to get easier for Villa and they’re already up on points from last season, compared to the corresponding games of last season. Something from the upcoming Liverpool game will make for a very satisfactory start to the season, since Villa got zero points from the same fixtures last season.